Q: Can someone visit my school and speak about crime scene technology? A: Crime Scene personnel are occasionally available for speaking engagement at schools. Please make your request for a guest speaker via email to: crimescene@bcso.us (be sure to include the age/grade range of students). Q: I am working on a degree in crime scene technology and would like to intern with the Brevard County Sheriff’s Office. What do I need to do to become an intern? A: The Crime Scene Unit accepts a limited number of interns each semester. Please send a letter detailing your internship request and current education level to the below address. You will also need to complete a Brevard County Sheriff’s Office Employment Application prior to acceptance. Q: I’d like to become a Crime Scene Investigator. Where do I start? 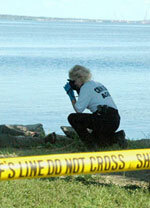 A: If you are interested in a career in crime scene investigation, visit Eastern Florida State College website.